Today's challenges were easy, yet difficult for me to complete. 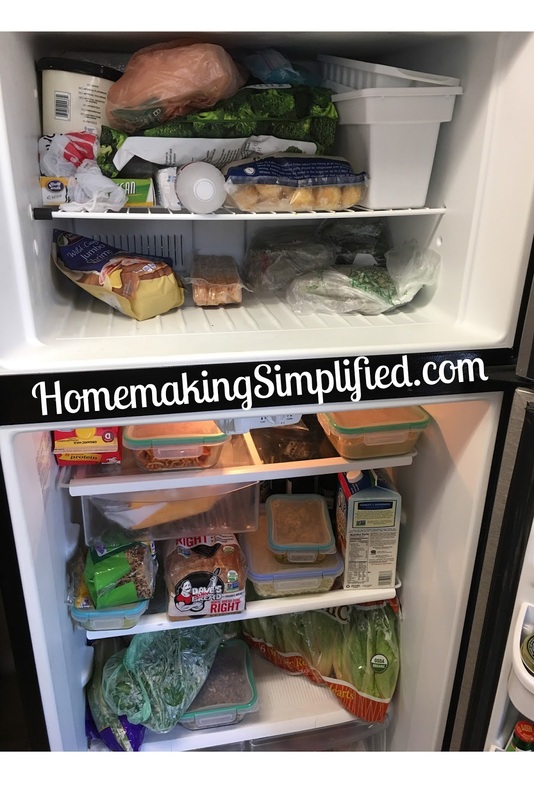 The Mary challenge asked what I can do today to bring my house to life, the Martha challenge was to wipe down and clean my fridge. Both of these seem easy enough, but they are both things I try to do routinely, so doing them today proved a little difficult. 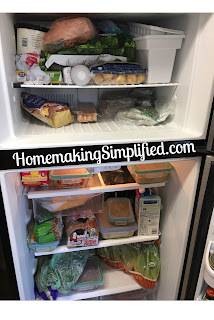 Right now my fridge is a little chaotic, but I make it a point to thoroughly clean (wipe, organize, etc) every time we do a Costco run, which tends to be every two weeks or so. In addition to this, I try to ensure we toss old food and that I keep things wiped down regularly. Because of this, I tried to find every excuse to not do today's Martha challenge. "I just cleaned it recently and will be thoroughly cleaning it again before next week (Thanksgiving shopping) so I really do not need to do it today." The photo I posted shows my fridge before cleaning it today. After battling myself, I decided to just do it. Although it was cleaned recently, I did have a few areas that could use a wiping. It ultimately felt satisfying to complete this task. The other cleaning tasks were also things that I try to do regularly. One was cleaning the top of my fridge (I did it just a about two weeks ago, but when I climbed up, I saw that it already needed it again) and to clean the faces of my cabinets--this was much needed and I didn't even realize it. In addition, I was to clean my oven and my microwave. Our family does not use a microwave (please don't use one), so that was not an issue and I am really careful about our oven, so all it needed was a quick wipe with a wet towel. Now, again, the Mary challenge for day two is a little more difficult for me. I feel like my house is full of life on a daily basis since we have three young children running around it all day long. But then again, I am sure that is not what the author is getting at. How can I "bring life into my home?" Today, I decided to make sure that dinner is ready and not just in process when my husband gets home. So while I was cleaning the fridge, I pulled out things that I need to use and found ways to use them. I hate making dinner, though I do it daily. It is one of the things that I dread the most. I feel like I never know what to make and I always procrastinate. Perhaps my procrastination is the major issue. My family enjoys staple foods, so figuring out the what really shouldn't be problematic, but since we make most of our meals from scratch, if I wait too long to start, then I cannot figure out what to make in a timely fashion since staple foods take longer to prepare. Today, "life" will consist of having food ready to eat as my husband comes home. Day three of the Mary challenge was really pleasant. I was prompted to ask my family what it is that makes them feel most loved. I will make an effort to do these things more regularly. One thing that I have really been reminded to do is to proactively make our home a place filled with grace. This is something we really try to do in the way that we decorate and encourage one another, especially in prayer, but it is always a good reminder. We want people to feel the love of Christ in our home, and that includes our youngest family members. "The wisest of women builds her house, but folly with her own hands tears it down." Let us each strive to be women who build our homes in wisdom and love. How do you bring life into your home?